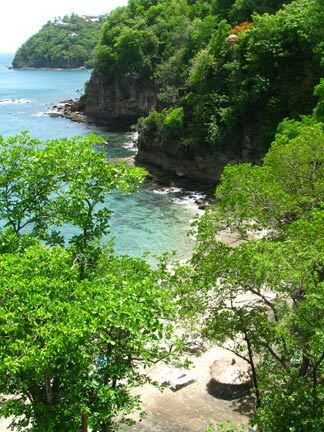 St. Lucia Travel: The Problem with Enchanting St. Lucia Resorts? The Problem with Enchanting St. Lucia Resorts? 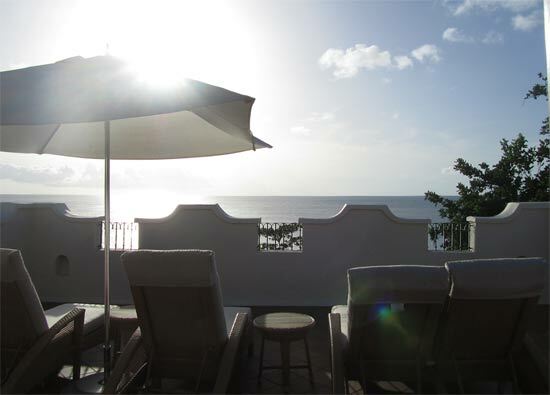 Set in the north of St. Lucia, Cap Maison is a luxurious Caribbean dream! It is home to some of the best dining on the island, a sweet, tranquil beach and plush suites. 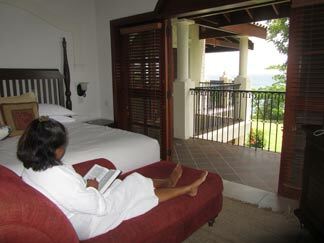 So in love with our St. Lucia hotel room, we barely left the resort the entire time we were there. Limin' in St. Lucia resorts and hotels, dining on St. Lucia food, swimming in St. Lucia beaches... A week of St. Lucia travel is not hard to take. It stirs up dreams of an exotic island of steep mountains draped in rich green foliage, banana trees and sugar cane. An island whose mountains curve to form sleepy sandy beaches, small cays and coves, creating some of the most breathtaking sights in the Caribbean. 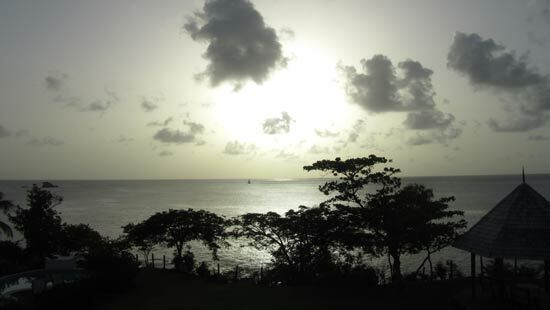 This Windward Caribbean island is the "raw" Caribbean, its character less touched by North America. It was exactly that. Believe it or not, flights to St. Lucia from major North American cities are almost faster than traveling to St. Lucia from Anguilla, despite the fact that Anguilla is already in the Caribbean! The whole St. Lucia travel process takes 4-6 hours. Flying on LIAT, the route generally goes... Anguilla-St. Maarten, St. Maarten-Antigua (change planes in Antigua - which not only means getting off the plane, but going through security again too!). We landed in the "small airport" located in the North of St. Lucia near Castries (the island's capital). 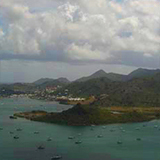 The international airport (Hewanorra) is located in the South of St. Lucia. There are non-stop flights to St. Lucia's Southern airport from most major American cities with American Eagle and Delta, and aboard Air Canada and West Jet from Canada. England also flies direct with Virgin and British Airways. Most other countries in Europe require connecting flights. First stop? Our St. Lucia hotel in Gros Islet, a 20 minute drive from the small St. Lucia airport in the North. 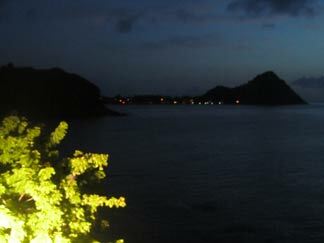 A cool calm came over us as we were warmly greeted at Cap Maison, our St. Lucia resort. Complimentary champagne in hand we were showed to our room, the 2 bedroom villa suite with a roof top terrace and plunge pool suite my Dad negotiated for a steal of a summer deal! 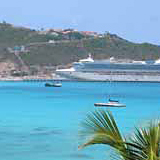 Note: Traveling to the Caribbean in the summer is one of the best Caribbean deals to be found. You generally have restaurants and beaches to yourself. The water and the weather is consistently warm, and the prices are low. In fact, they are lower than low with "summer special" negotiating power! 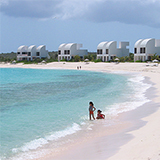 Click here to read more about traveling to Anguilla in the off season. Upon entering our room a strange thought emerged, "Will we ever be able to tear ourselves away from this St. Lucia resort?" On every holiday, whether it be in Rome or London, Mexico or Nova Scotia, exploring is always priority #1, my Dad operating as our fearless leader. But Cap Maison brought our innate desire to explore to a near screeching hault. This spot was simply too stunning to leave. 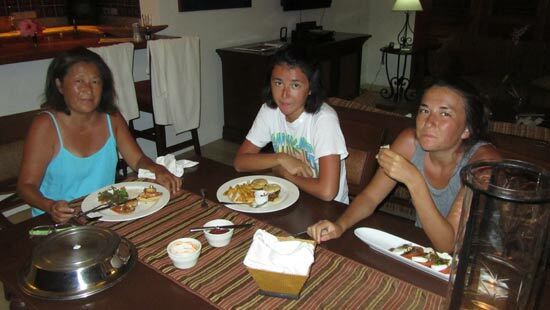 The emotional cost of time not spent in the villa just too high. For the next day and a half we would be "vegging," as my Dad calls it. Of all of the St. Lucia resorts Cap Maison is one of the most recently built. I swear, it must have been constructed to my Dad's every whim and wish. I've never seen him happier in a hotel room that wasn't in Anguilla. As our kind host swung open the heavy wooden door, my nerves tensed. Cap Maison was my choice. I found it online, fiercely recommending it to my Dad based on all of the rave reviews. A lot of weight was on my shoulders. 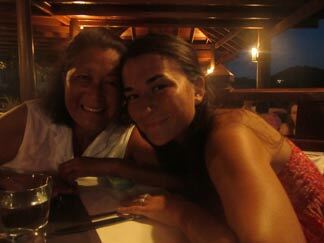 Of all the St. Lucia resorts would my family love Cap Maison? Would it live up to all the kudos? Yes... and more! The only thing my research didn't prepare me for was how impressive, luxurious and expansive (yet cozy) the space actually is. The St. Lucia villa suite clocks in at over 3000 square feet. Now I know why they call it a "villa" suite! This unit features a master bedroom and master bathroom, a guest bedroom bedroom and bathroom, a powder bathroom, a kitchen and eating area, a dining area, a living area, a downstairs terrace, and an upstairs pool terrace. The villa suite is so enormous, we spent half of our time looking for each other! I would hear a faint "Nori? Yuki?" as my Dad was trying to find us in this St. Lucia resort's palace of a suite. Yuki, our fashion queen, spotted the amenities immediately. The complimentary bath showers and gels were the to-die-for "Aqua di Parma." The furnishings were rich and comfortable. 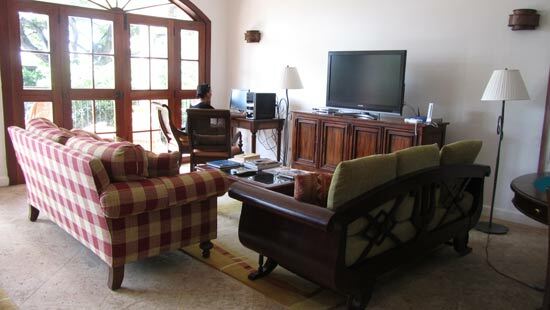 There is a plasma TV with cable in every room, and air conditioning in both bedrooms. But, just like my Dad likes it, the rooms aren't kept at arctic temperatures like many other hotel rooms. The best part? You can hear the lapping of the Caribbean sea below and have air conditioning. The kitchen, dining and living areas must be made for entertaining. The kitchen is complete, with a full fridge, microwave, toaster, oven/stove and a casual dining area that is separate from the lavishly long dining table in the "official" dining room. Waiting for you in the kitchen area is a homemade bottle of rum punch, a bucket of ice, Bitters, a whole nutmeg and grater. The essential ingredients of the perfect rum punch. The dining and living space are large, becoming even more spacious when you throw open the doors of the expansive private balcony (actually there are 4 balconies including the...). The kind and gracious staff at Cap Maison must have fun showing their villa suites with roof top terraces, waiting for the look of incredulous excitement to wash over their guests' faces! We too fell captive to the roof top terrace's allure, views, endless beauty... How could you resist? Why would you resist? Was this really ours for 3 days? The terrace, in the same spirit and style as the living space downstairs, is expansive. Mexican style tiles, 6 sun loungers, dining table, and a wet bar. 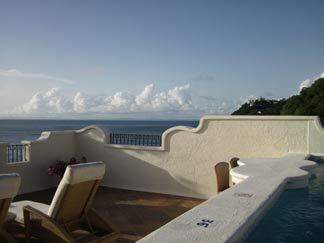 Don't forget the private plunge pool and 180° views of the Caribbean sea. My Dad sat on a sun lounger on the terrace, staring off into the distance and asked, "Have we ever stayed anywhere nicer? What have we seen that beats this spot, right here?" I couldn't think of a single resort, room, or setting that matched the sheer magnificence of that terrace. Cap Maison's small, gentle St. Lucia beach, Cap Maison Beach. 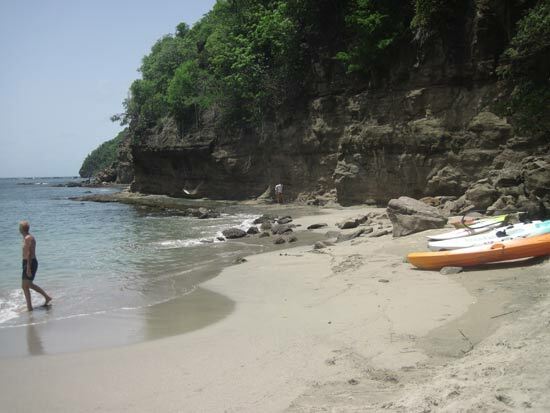 Anguilla has the nicest beaches in the Caribbean, but this is the ideal St. Lucia beach. It is surrounded on three sides by steep hills covered with lush deep green plants, the water a true turquoise-y sea-green. Had I just landed on the set of "Survivor?" And when you reach the beach? It's as though time stands still. All that remains is the lull of the waves and the thick heat of the Southern Caribbean in summer time. Good thing the water is cool, and the drinks at the beach hut are even cooler! Down on the beach Cap Maison offers many water sports: water skiing, banana boat, kayaking, sailing, snorkeling and windsurfing. Can you see the hammock suspended along the cliff wall? This St. Lucia resort also has its own 46' boat that can be chartered for around the island tours, to Martinique, or even down to the Grenadines. 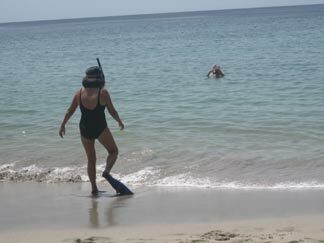 My Mom and Dad opted for a little snorkeling. Too bad for my Dad but his snorkeling partner (my Mom) almost drowned before setting off, gulping down gallons of sea water, sputtering around. The good news? (But also the sad news) She was in 2 feet of water! He ventured off into the reefs alone. One rum punch and one fruit daiquiri (for Yuki) coming up! 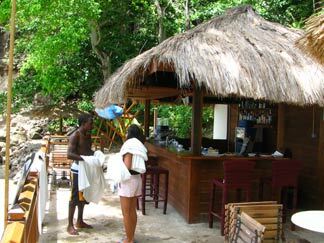 The beach bar also serves small snacks and light lunches. Our fingers pruned from the fresh water pool and the Caribbean sea, we all headed up from the St. Lucia beach after my Dad found the sparkling Caribbean fish he was looking for. 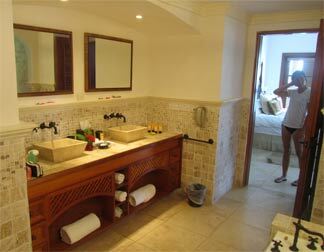 Each and every room in this St. Lucia hotel is desirable. 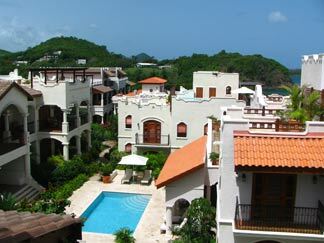 The first floor St. Lucia villa suites don't have a roof-top terrace, but their private pools are enormous. Ground floor rooms without private pools open onto an even larger shared pool. 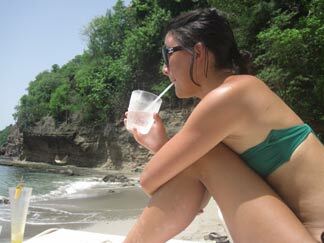 Everyone is afforded true privacy and luxury, the makings of memorable St. Lucia travel. 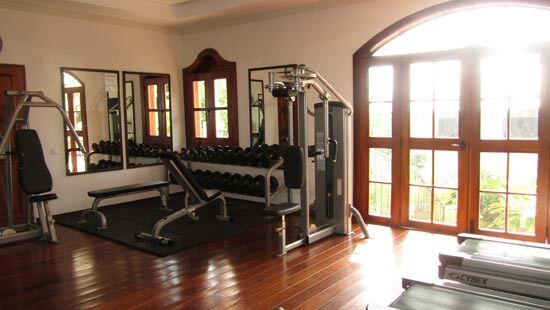 Tucked inside the main building, away from the grounds of rooms and villa suites, there is the Spa at Cap Maison, a fitness center and a media room with an "honesty bar." This was certainly a luxury since this was a "no computers" St. Lucia holiday! Yuki and I snuck a few visits to Facebook.com in their media room. Shhh, don't tell Dad. He he! The last part to explore? St. Lucia food. I did not know what to expect restaurant-wise in St. Lucia. 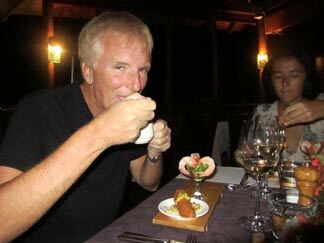 Everyone I knew who had taken holidays in St. Lucia never mentioned heavenly dining experiences or dining experiences of any kind in fact. After sipping a rum punch and watching the sun go down, we headed down to The Cliff at Cap, the St. Lucia hotel's restaurant. If you were measuring St. Lucia restaurants on setting alone, The Cliff at Cap would win, no contest. 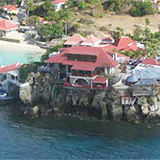 As the name would suggest, The Cliff is just that, perched on a cliff, high above the breaking waves with views of the popular Rodney Bay in the distance. 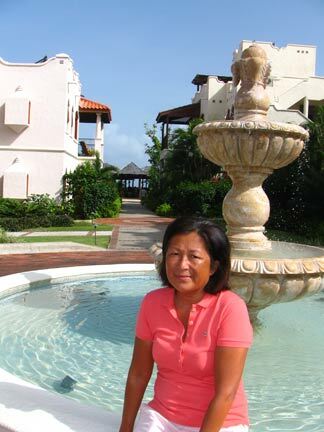 The friendly service was on par with some of our favorite five-star Anguilla restaurants! But what about the St. Lucia food? It was a Saturday, a night which offers a fixed menu of "tapas" at The Cliff. Seafood chowder, a brie melt, and a shrimp cocktail were the appetizers. Steak, lobster risotto, and pumpkin ravioli was the main course. Chocolate tart, mango ice cream and coconut pie was for dessert. Sliders for Yuki and my Mom, Mahi Mahi for me, and my Dad was wild about their shrimp bruschetta. My tip? Make sure you ask for two bread baskets. Their freshly baked rolls, bread sticks and focaccia are out of this world. We almost said, "Make that 3 bread baskets!" As for the rest of their menus... Let's just say that we were in for a serious treat. Breakfast has always been my favorite meal. There was no better way to start the day than with Cap Maison's complimentary breakfast of your choice of croissants, muffins, toast, eggs, omelets, bacon, kippers, fried tomato, pancakes. Name it and it's yours! So, just what is the problem with staying in a resort so enchanting as Cap Maison? The problem was peeling our crispy bodies off of the sun loungers on the roof top terrace for some St. Lucia travel adventure. We became so contented and lazy that it was hard to get our spirits sparked and blood pumping for some sight seeing and delving into the culture. Finally, on the last day of our three day stay we decided to leave this tropical shangri-la and explore St. Lucia. Click here for our St. Lucia travel journal with our visit to Castries, The Pitons, and The Sulphur Springs. Rates start around $400/night in the low season for a standard room, going up to $1,500 or so in-season for the most luxurious villa. For availability, rates based on season & room type, and to book, click here. 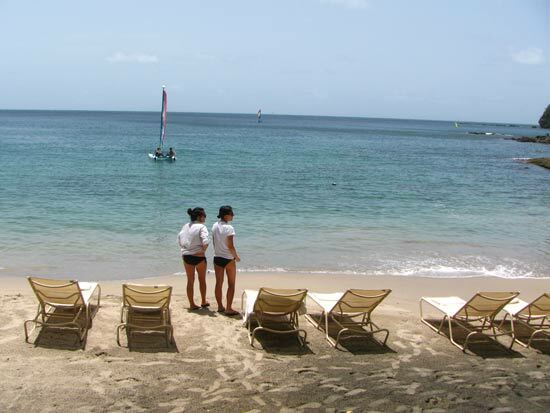 Sandals St. Lucia has a big presence with three large all inclusive locations around the island. Sandals Halcyon St. Lucia, a couples only hotel, is located in Choc Bay just North of the island's capital, Castries, famous for its "Pier Restaurant" that sits above the water. 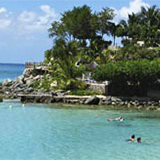 Sandals Grande St. Lucia is on the popular Rodney Bay (further north of Castries). It is one of the most impressive properties, with a swim up bar and a large pool that snakes even to the door steps of certain hotel rooms. The Sandals Regency St. Lucia is for the golfers and foodies with 7 restaurants! With Sandals St. Lucia you can participate in their "exchange program," which grants you access to all of their locations' swimming pools, restaurants and various unique amenities. You can never go wrong with Sandals St. Lucia! Jade Mountain St. Lucia is often said to be the island's most luxurious resort. It's where the "celebs" stay. 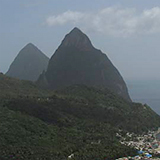 The location is one of the best, with a view of both of The Pitons. Equally as eye-grabbing is the hotel's unique architecture and design. Each room/suite has only 3 walls. The rooms open on to a private plunge pool that drops off to the endless vista of the Caribbean sea and The Pitons. It is beauty of a new kind that embraces an open-air concept! Jalousie St. Lucia is perhaps the second most luxurious of all St. Lucia resorts. Here, as with Jade Mountain, you are provided with the unique "Piton experience," but afforded the comforts of traditional luxury hotels. 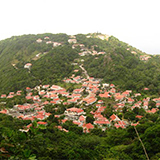 Jalousie's setting is distinct set between The Pitons. The property is composed of small West Indian inspired cottages. 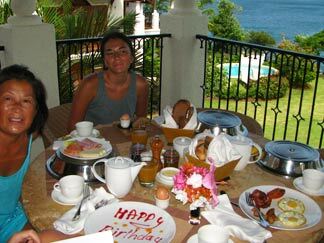 Make sure you request a "renovated room" to ensure a more luxurious St. Lucia holiday. We were so curious about Jalousie St. Lucia that we tried to "get in" for a drink. The security and safety at this hotel is so high they wouldn't even let us enter the premise without parking our car outside of the resort and taking their shuttle into the property! You will be in safe hands at Jalousie St. Lucia. Note: Be sure to check where your flight to St. Lucia lands. Hewanorra International Airport in the South is about an hour taxi drive from hotels located closer to the North in Gros Islet and Rodney Bay. If you are flying into the International airport, but staying in the North, you can reserve a quick helicopter ride to the island's "small airport" in the North, only a 15 minute drive to most resorts in the area.